Q: Lewis, congratulations, you equalled Senna's record; tell us about your magic start. ? Lewis HAMILTON: Yeah, well I firstly have to say a big thank you to all these fans that have come and stood in the rain... I don't know if anyone can hear us... Oh you hear us: Konnichi-wa! Really I'm so happy right now. The team has done a fantastic job this weekend. It's great to be back up here with a one-two. I had a great start. Thanks again to the team for working so hard to make sure we get good starts this race. For me to come here to a race where I used to love watching Ayrton drive and to match his wins... yeah, I can't really describe it, it doesn't really feel real at the moment. Q: So how important was it for you to strike back after Singapore? Hamilton: It definitely was important for us to strike back. The Ferraris were incredibly quick in the last race and I guess we didn't bring our A-game, so we really had to take a step back in these last few days and make sure we brought it here and, as I said, couldn't have done it without this team. Just remarkable what they've done. The car was beautiful to drive today. Q: Thanks Lewis. Coming over to you Nico. Fantastic fight-back to the podium but tell me what happened when the light went out? Nico ROSBERG: Yeah, Lewis just got a better start, fair play, and then it was a good battle into Turn One but in Turn Two he had the inside and just made it stick, so that was the end of it there. Then it was great to fight back to second place, because fourth place would definitely not have been acceptable. Second was the best possible thing after that, so I was happy with the fight-back and great also for us as a team. To be back up here after Singapore is really awesome. Q: Seems that Lewis is pulling a little bit away in the championship. Can you still catch him? Rosberg: Yeah, for sure, it's going the wrong way - definitely. I had to win today, that was important but it didn't work out. Just need to try to win next time out. Q: Sebastian, being here on the podium again after a marvelous victory, what do you think about it in front of these fantastic Japanese Ferrari fans? Sebastian VETTEL: Yeah, thank you very much. It's great to be back on the podium here, it's, I think, my favourite race; I love the track, I love the fans, I love the trophies. Unfortunately, I didn't get the bigger one today; it was close with Nico. I think we had a chance but it's always easy with hindsight. Overall, I think it was a fantastic race. The start was very tricky and it was interesting to see those two fighting in the first corner - obviously I could benefit - but, yeah, all in all, very happy with the race today. Q: Tell me what direction is Ferrari going in right now - are there more victories to come this season? Vettel: I think we are going in the right direction. Obviously we knew from the beginning of the season that these boys would be difficult to beat. They're doing a great job, first of all, both of them. They have a great car, a great engine and all in all it makes them difficult to beat. But I think we are much better than people expected and it's nice, as I said, to be back on the podium here. On top of that it's been 20 years now that I have been with my helmet supplier Arai. I know that I shouldn't probably mention this but it's something very special. I remember when I was a small child walking in, so thanks also to all the people in Japan at Arai and yeah, I love this podium. Q: Thanks for the commercial block, Seb. Coming back one more time to Lewis. Lewis, we are in the land of karaoke and you are a brilliant singer, not only a brilliant driver, so what will be the song you are going to perform tonight then? Hamilton: 'Victory Dance'? I don't know! I did a song last night called 'Victory' so that's the one I'll be playing. Q: Lewis, well done again, congratulations. It seemed to be a trouble-free race once you had taken the lead at the first corner, but we heard one or two mentions of heat in your seat, which we've heard before, and also vibrations as well, so how bad was that? Hamilton: It wasn't too bad, I've definitely had worse. It was such an amazing race. This has been a circuit that I can honestly say that I've struggled [at] through all the years that I've come here but one that I've loved driving, and I think that goes for all the drivers. But you really want to come here and dominate at a track like this. I was able to get the balance in the right place, my engineers did an amazing job - Bonno, Ricky and just the whole crew did a great job to get the car, with the short amount of time we had, in a beautiful window. It was better today than it was even in qualifying. I was really able to work on my lines and improve and at the front there it was just a beautiful... it's like sailing. When you go through the corners here, it's flowing. Honestly, I wish I could share the feeling with you. Also knowing that this would be the race that I would equal Aytron, who won here and who had quite an interesting here. So, yeah, quite an emotional day. But to be honest I'm not a teary guy, so I'm just full of joy and happiness and light and I'm really grateful for, as I posted the other day, all the people who have helped me get to where I am today and this team, because without them I would not be here. Q: Nico, can you be as ecstatic about your car as Lewis was about his? And what about toughing it around the outside at that first corner? 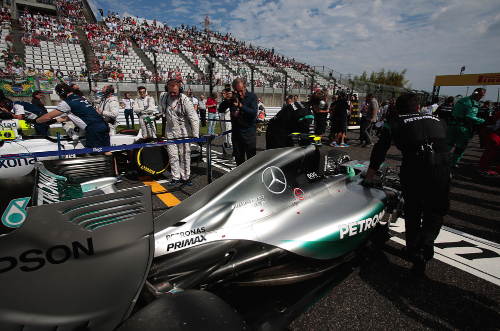 Rosberg: Yeah, for sure the car is really back to its best now and that's reassuring after Singapore, so that's great. Especially in qualifying, it's just a pleasure to drive. Like on rails. Then in the the race, yeah, start of course. Pity to lose out at the start and then big battle around Turn One and Two and got very close on the exit of Turn Two so I had to back out of it there and that lost me the race eventually. Q: Sebastian, it seemed to be damage limitation. You couldn't really prevent the undercut and from then on, was there anything you could do about the Mercedes? Vettel: Well I think we thought we were safe because tyres were in reasonable shape but I think Nico was a surprise, the pace he had in his out-lap. So, I was very happy with the in-lap, which goes at the same time, but it was a question of a couple of tenths. Into Turn One he just had the upper hand and then it was clear it would be difficult because he was catching before. So, also the fact that Lewis disappeared: they had a bit more speed today so, yeah. Had we pitted one lap sooner I think it could have been more interesting and challenging for Nico to get past. It's not so easy to follow the cars here through the high-speed sections, so I think we had a good chance but, yeah, probably underestimated the out-lap that he had, so, with hindsight, it's always easy so, nevertheless, it's a great day. Good recovery. Especially as Friday wasn't that good for us. I know it was wet but still, the feeling we go was not that great. Saturday morning as well. So, yeah, good quali and obviously that was the base for another podium today. Q: (Frederic Ferret - L'Equipe) Question to Lewis and Nico. Can you describe for us the way you start? Is it a different way or is it the same way for both of you? Hamilton: Individually are they different? It's the same sequence for both of us. Yeah, it's been the same pretty much since we got to Formula One. It's not really changed, the start, has it? I mean, you have to go through a different sequence to get to the same thing but it's just a different equation basically. Rosberg: It's the same but you do have your own individual input and you can do your individual thing. You can fine tune it to your liking. Q: (Andrea Cremonesi - La Gazzetta dello Sport) Sorry for Nico but we need to come back to that moment where you were a little bit out of the track. Do you think it was a little bit too harsh, Lewis? And for Sebastian, a question, now you are 59 points behind Lewis is it realistic to think that's it's fight for the championship or is it done? Rosberg: I haven't even seen it myself on TV. For sure it was close, I had to avoid a collision. It's difficult for me to comment now. Vettel: It's not done 'til it's done. So, the chance is there - and what kind of racing driver would I be if I stopped believing? So, of course I know it's difficult because the opponent is very strong. They are currently in stronger form than us, so it's not easy to turn things around when you are behind - but you have to keep believing otherwise I guess it's pointless rocking up and trying to fight. I think there's always a chance on Sunday. Being realistic, as I said, I think it will be very, very difficult but who knows what's going to happen. We have to do our thing and that's the maximum we can do. Everything else is not in our hands, it's probably in there hands. Q: (Dan Knutson - Auto Action and Speed Sport magazines) Lewis, could you give us your view of that very close moment there coming out of turn two with Nico? Hamilton: I didn't really feel it was particularly that close but the inside line is the inside line, so I had my corner and so we were very very close but I was basically understeering, I was running out of grip. I imagine Nico was running out of road, but that's what happens when you're on the outside. Q: (Luigi Perna - La Gazzetta dello Sport) Seb, are you confident in the development of the car for the next races and the end of the season, considering that maybe you are going to use a fifth engine with more upgrades? You still have four tokens to spend. Vettel: Well, there are still some races to go. We are pushing as hard as we can. Obviously last weekend and this weekend were very different but I think it's more down to them struggling but we had very strong form in Singapore and we used our chance. It's very simple; if the chance is there, we have to use it. We know though that they are very very strong so we will do everything we can in the remaining races of this year, trying to catch them, trying to improve ourselves first of all. I think there are always lessons to learn; this weekend was interesting. Again, thinking about tyres: Friday, Saturday, I think there are some lessons and some things that we can improve. On top of that, as I said, we try to improve the car naturally. I think the times of big updates, they are over. We try every race to bring everything we have and yeah, everything else we will see when we get there. Q: (Frederic Ferret - L'Equipe) A question again to Lewis and Nico about the start: do you prepare your start differently, Nico and Lewis, on the formation lap? Do you prepare it differently and can you explain why it was so good for you, Lewis, and so bad for you, Nico? Hamilton: Honestly, there's not really much difference. You have to do your sequence when you leave the grid, then you do a normal start. It's the same movement with the paddles. The input differences are the reaction time from the paddle and then how smooth you are with the second paddle in terms of how you... and also how smooth you are with the throttle which makes the difference generally. And also obviously the clutch has to perform, sometimes it overperforms but with the new rules we generally have the same set-up with that. So yeah, I guess it's just the luck of the draw: sometimes it's right, sometimes it's wrong, sometimes you've got the clutch too hot, sometimes you've got it too cold, sometimes you have your tyres too cold, sometimes you have them too hot. So it's a combination of things, but generally the sequence is very very similar between - I'm pretty sure - the whole grid. Rosberg: It's always the same thing, the same we practise before the formation lap, going through the pit lane and then on the exit of the pit lane, formation lap practice, so you get a feel for it. That's it. Q: (Andrea Cremonesi - La Gazzetta dello Sport) For all of you: some of your colleagues yesterday were worried about the tyre pressures. They said there was too much pressure and they were worried they might have some problems during the race. Have you been affected in the race by that? Rosberg: No, not at all. Everything was perfect. No problems at all. Vettel: Were you low again? I'm joking. You can laugh as well. It was a joke, come on. Hamilton: I don't know really. All I know is that the tyres were... we don't say it very often but the tyres were pretty amazing, particularly in the last stint. They were the best they've felt for a long time. They really felt really good but it must have been how it felt for him (Vettel) in the last race. Through qualifying, they were good but generally in the race it was getting better and better as the car gets lighter and stuff but I don't think they were a problem this weekend.